The second Sunday night cooking after we came back from 2 weeks holiday in Germany. That week was so tough, as I was going through the laid off issue at work, too crazy and tired to deal with. Finally weekend, and I did feel a lot better! Craving for Japanese, and I wanted to cook this miso black cod for quite some time, why not doing it then?! I was thinking to make the vegetable udon which is light and my husband loves it! So, miso black cod and vegetable udon for sure! Let’s see what else should I cook? The first place I go check out was that store right next door, selling Japanese imported food. I found what I needed for udon and black cod, I also found some Japanese green pepper which is hard to find in those regular super market. On top of that, I bought this chicken sausage with chicken bone on it. Nice touch, but let’s see how does it taste. First of all, we need to marinate the black cod. I was trying to follow the recipe of Nobu, but then I realised that I should marinate the black cod 3 days in advance!!! Errrrrr……… forget it! I am going to marinate that for 2 to 3 hours only, that’s the best I can do now, and see how that going to taste. I might try to make it 3 days in advance next time. I do not have mirin with me, so I just heat up some sake, let it burn and then add white miso paste and sugar. Cool down the mix when everything is fully dissolved, and put the black cod in the sauce and let it marinate for few hours in the fridge, of course the best would be 2 to 3 days. I am going to cook the fish with the sous vide, so place it in the vacuum bag and bathe in 50C hot water for 18 minutes. Then fry it with butter in a hot pan until both side turn brown, and I have to say it is really tasty!!! Next time I will try to marinate them for 2 to 3 days and see what is the difference. 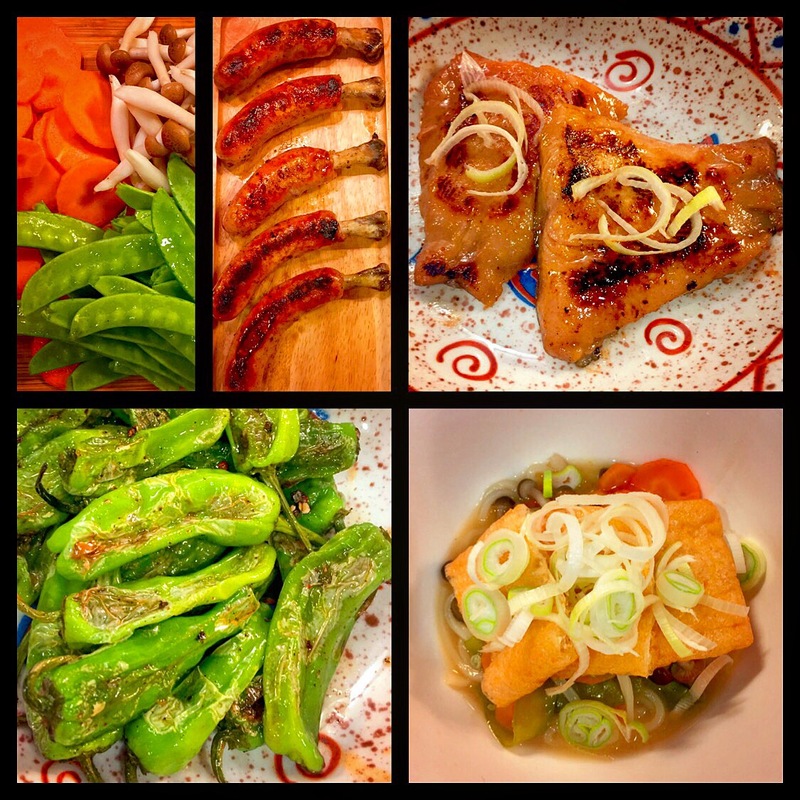 Before eating the black cod with vegetable udon as main course, I cooked the Japanese mini green pepper and chicken sausages as our starter. I am not going to write about the udon, as I had this in one of my blog already. For the green peppers, it’s easy, instead of grill them, I fry them with hot pan, and simply season them with salt, pepper and some paprika. They are just so delicious, and we can just keep eating them if we have more! The chicken sausages are also quite tasty, I should come up with my own one next time. Keeping the bone and use the chicken meat to make my own sausage! Go with cold sake, and what a nice Japanese dinner!! !